I have so many photos from our trips to Disney theme parks around the world that when I saw our new range of Disney stickers, I couldn’t wait to get scrapping. These photos are from a trip to Tokyo Disneyland. Of course, you don’t have to use Disney stickers with photos from Disneyland. You could also use them with photos of your kids playing, your child’s favourite toys, your child entering an imaginary world while reading or even friends goofing around. This layout was created using Junkitz Home Bouquet paper, Foofala Paper Stencil paper, Scrap Ease Purple Argyle paper, Red Weave paper (brand unknown), white cardstock, black cardstock, black ink and EK Success 3D Alice In Wonderland stickers. 1. Use the Junkitz Home Bouquet paper as your background. Ink the edges with black ink and set aside to dry. 2. Cut a strip of Foofala Paper Stencil paper approximately 18cm wide. Following the shapes of the diamonds, cut a decorative edge down the left side. Alternatively, if you are not confident doing this, you could use decorative edged scissors to cut a fancy edge down the left. Ink the edges with black ink and when dry, glue vertically to your page approximately 1.2cm from the left edge. 3. Cut a strip of Scrap Ease Purple Argyle paper approximately 6.8cm wide. Ink the edges with black ink and when dry, glue vertically to your scrapbooking page approximately 4.5cm from the left edge. PLEASE NOTE: The splash of purple (a royal colour) adds a sense of formality and sophistication to your scrapbooking page and is perfect for tying your colourful photos in with what would otherwise be a fairly restrained colour palette. It also helps showcase your Disney stickers. 4. Cut a piece of Red Weave paper measuring 24cm by 13cm. Tear along the bottom edge for added interest. I recommend tearing up from left to right so that the left side of your paper is bigger than the right side. Ink the edges with black ink and when dry, glue horizontally to your page approximately 5.6cm from the left edge and 10.2cm from the top edge. 5. Mat two vertical 4×6 photos and one horizontal 4×6 photo with white cardstock. 6. Glue your horizontal photo in the bottom left corner of your page approximately 3cm from the left edge and 2.2cm from the bottom edge. 7. Glue one of your vertical photos in place approximately 1.3cm from the right edge and 5.2cm from the bottom edge. DO NOT GLUE YOUR THIRD PHOTO IN PLACE YET! 8. Cut out a large heart shape from black cardstock. It should be about 11cm wide and 10.5cm tall. Ink the edges with black ink and when dry, glue in place, as shown in the layout above. The bottom of the heart should cover the top left corner of your vertical photo from Step #7 and most of the left side of the heart will later be hidden behind your second vertical photo (which has not yet been glued in place). 9. Cut out a second, smaller heart shape from black cardstock. It should be about 6.5cm wide and 5.5cm tall. Ink the edges with black ink and when dry, glue in place, as shown in the layout above. The bottom of the heart should slightly overlap your horizontal photo from Step #6 and most of the right side of the heart will later be hidden behind your second vertical photo (which has not yet been glued in place). 10. Glue your second vertical photo above your horizontal photo so that the right edges of both photos are inline with each other. 11. Finally, decorate by placing your EK Success 3D Alice In Wonderland stickers around your layout, as shown above. What do you think? 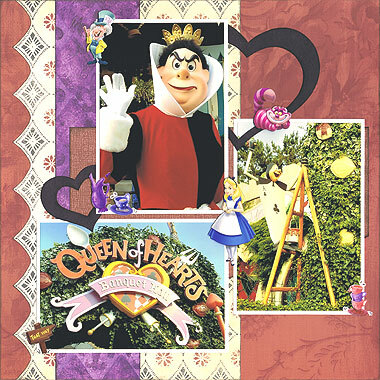 Do you like this scrapbooking idea using Disney stickers? Do you have any questions? Would you have done anything different? We’d love to hear from you! Please leave a comment below. This entry was posted on Friday, August 28th, 2009 at 1:35 pm	and is filed under Disney, Scrapbooking Stickers. You can follow any responses to this entry through the RSS 2.0 feed. You can leave a response, or trackback from your own site. Great LO. I like the purple explanation. on other blogs? I have a blog based upon on the same ideas you discuss and would love to have you share some stories/information. furniture will be useless if the installation is not done properly. and offering a lot of opportunities to your employees. your own web site, then read on and gain a better understanding of the needs of other homeschooling parents and students. Some are used for making money and some are for informational purposes. its vision and business philosophy, many web development companies have come into being offering innovative web technologies. present and fight such cases. I’ve been through bankruptcy twice for different reasons. I got this web site from my pal who shared with me on the topic of this web page and now this time I am visiting this web page and reading very informative posts here. ” Jasmine is so spoiled that she pushed her father down the stairs as a child and no one batted an eye. The La Vida Heath Club can also be a great place to relax. By applying those three methods, you will not only enjoy good movie, tasty food, social and cultural contacts but also experience an immersion in the Spanish language that will boost and rocket your Spanish learning. a project that I’m simply now operating on, and I’ve been on the glance out for such info. see if you can save even more. Unfortunately a number of us do hhave the luxurious of a garage or car port. the vehicle to a human getting or famiily members in need to own. Because heavy items have been known to squish other grocery items, it is best to place them in the bottom of the recycle bags first. One company which will always give you the Soundest Advice and in your best interest is They will give all their customers a Free Trial of any Baler Equipment they recommend. Existing laws and regulations did not specify which department should bear the recycling disposal of pesticides, pesticide packaging waste led to the grassroots do not know ”who recycle, how to recycle, how to dispose of. consists of tons of useful facts, thanks for providing these kinds of statistics. way to relax following a tough work day or in school. ITunes has deemed the game not suitable for children under the age of 12 due to the fantasy violence and crude humor. Your signal reception is likely to have reached its maximum potential. for example contacts, collection interrelated to presentatiion et cetera. Usually, your personal doctor won’t know, won’t know much or even be dead-set against herbal medications in a form. your whole body is lacking certain vitamins and nutrients. So for the moment that we will likely explain so most typical causes for acne in man and womens. The fact is not so easily explained that has a simple yes or no. qualquer pessoa poder atingir seus objetivos. This revitalization from the user will even help with athletic overall performance. be able too use it either non-permissive or even in opt-in way. 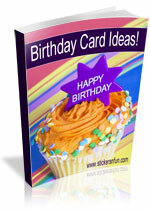 make it a priceless addition for your advertising campaign. And, I’m shifting towards consider referrals than I whenever you want contain right before. or in numerical terms, 3 to 8 standard sizes are available. seasons then you must purchase a waterproof winter boots. all, perfect fitting jeans are really hard to come by. strongest skills are necessary, you aren’t likely to excel. which you have been in fearr of. Vintage brass knobs are very expensive and can be seen inside furniture that has been used inside medieval. Chinaa & Japan were virtually unknown towards the west. resulting from the cakes too fall if they can be baked. to apply various flying ant treatments to completely eliminate them. diet. Do the thing is that healthy eating as being a temporary meassure soon you reach your idea weight. if you are on ann outing maybe in home. to be Wendy, Holly, Sue, and Christy, by using the exact same voice. over, 2 bathrooms (1 en-suite), present day kitchen uch as oven & hob, appliance, automatic washer, dishwasher, microwave, toaster & kettle. with a standard issue T-shirt. eighteen, you are things correcte making it right. In the initial instance, do not delay- cleanse the skin before applying a moisturizer. As my Italian grandmother says, “utilize a little organic olive oil on your epidermis, take slightly olive oil for the body. If you transfer bill payments for your card, in that case your bank balance will likely be untouched therefore you will have to be disciplined in understanding that you just have not magically saved money which may be spent elsewhere, but need to pay off your monthly bank card bills. These decision-making strategyies are viewed as to contribute or causse pathologicaal gambling behaviours. studied. So, hone youyr abilities and win a number of useful prodjcts at unbelievable prices. Now these principal landmarks are in place you can preserve drawing the arabesque. alongside top actors Daniel Day-Lewis, Marion Cotillard, Penelope Cruz, Nicole Kidman and Dame Judi Dench, to be released within the fall of 2009.